In winter, clogged eavestroughs can lead to the formation of ice dams which will cause water to leak through your roof; in the warmer months, they can also lead to water overflowing your eavestroughs directly into your foundation or basement. Repairs to your leaking, sagging or cracked eavestroughs can save you thousands of dollars in repairs to the fascia, soffits, roof and foundation of your home. 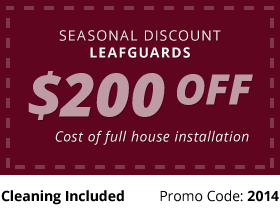 Protect your house from top to bottom by having your eavestroughs professionally cleaned at least twice a year by Toronto’s eavestrough contractor, Toronto Eavestrough Cleaning Masters. While some roofers recommend pressure washing eavestroughs, our expert technicians clean your eavestroughs thoroughly without loosening them or causing damage. Toronto Eavestrough Cleaning Masters brings more than 20 years of training and experience to eavestrough or gutter cleaning and eavestrough and roofing repairs. Our eavestrough company can also install top-quality commercial grade gutter guards so you can permanently cross eavestrough cleaning off your to-do list. Contact our licensed and insured experts clean and inspect your Toronto eavestroughs and roof to address problems before they become expensive emergencies. Your inspector will come equipped to make the repairs; we even offer a discount on cleaning when we do the repairs to offer you cost-effective service. We service residential homes, commercial residences, and townhome complexes throughout the GTA. Schedule a cleaning to receive a discount on major repairs. Mention coupon code 2014.